The Programme Ahi Baa Uma ( PABU – Lit. Light for the house) Team, Training and Product Development Manager and Operations Manager journeyed out of Dili to Maubesse recently to providing training to all the staff from the Same, Maubesse, Ainaro and Aileu offices (known as the SAMALEU Region). The team left Dili and travelled the ~60km to Maubesse in about 3 hours. 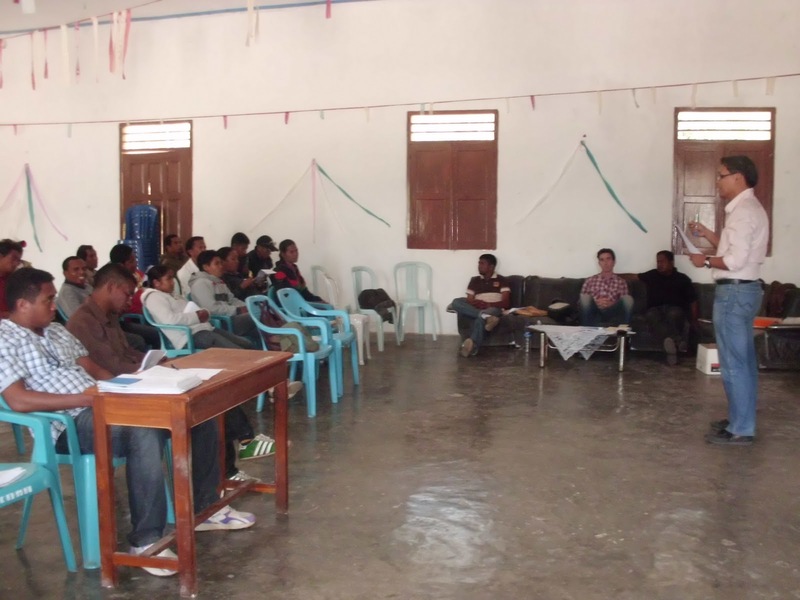 Arriving in mountainous and chilly Maubesse, in the Ainaro District at 9am the team assembled the staff and began to conduct the training on PABU, Client protection and Salary Loan changes. Total staff travel time was about 30 hours for the approximate 30 staff in attendance, 10 from each district of Aileu, Manufahi and Ainaro. The commitment of staff to travel so far in adverse weather conditions and on Timorese roads on their scooters is testament to their desire to learn! We were lucky that the Regional Manager had been able to secure emergency venue to conduct the training as the mother of the owner of the original training site had died the previous night and the previous site was now being used to house the extended family in preparations for her mothers burial. 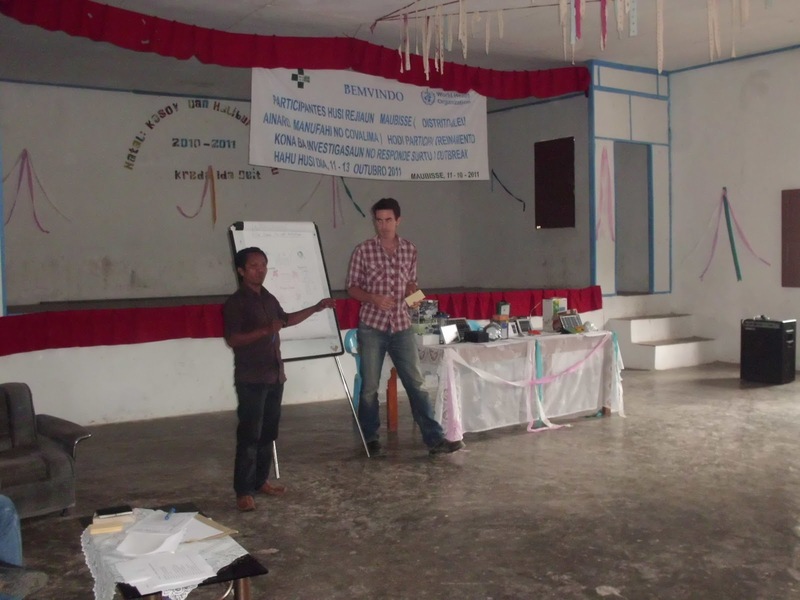 The Operations Manager, Mr. Nimrod De La Pena presented in Tetum (His 4th Language!) updates on the Salary Loan program to staff and conducted exercises to ensure that the staff understood the implications of changes in the interest rate for salary loans and how balances will be affected by the changes. Who is eligible for loans to purchase solar lighting products and who is eligible for loans to be Sales Agents or Distributors. The loan application and distribution process for Consumers and Sales Agents. A PDF version of the Information memo is attached here. 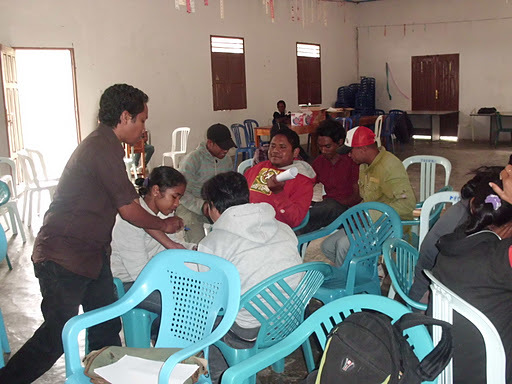 The team also conducted some role-play exercises for staff where they had to determine if their colleagues were eligible to receive loans under the program. Finally, the solar products were demonstrated to great effect in the gathering gloom of rain clouds. In fact, most of the solar products had to employed during the training to provide sufficient light for staff to read the materials, as electricity is unavailable in Maubesse during the day! After a full day of training the team arrived home in Dili about 8pm.